This primitive hut was excavated in the vicinity of an ancient Egyptian temple in Medinet Habu, Western Thebes. Judging from its four-room plan and the assumed date (early 12th century B.C.E. ), it possibly provided shelter to ethnic Israelites who might have been employed by Ramesses IV in the demolition of a temple built at the site a few centuries earlier. Different colors highlight four groups of individual rooms. Photo: U. Hölscher, The Temples of the Eighteenth Dynasty (Chicago, 1939), p. 71. Domestic architecture of the Land of Israel during the Iron Age II (c. 1000–586 B.C.E. ; the First Temple Period) is dominated by one architectural form, the so-called four-room house. That’s an archaeologically proven reality. In fact, the typical four-room house with pillars was widespread already in the Iron Age I (1200–1000 B.C.E. ), but how did this house type come about and precisely when? Volumes have been written on the subject, with no conclusive results. Biblical Archaeology Review’s Editor, Hershel Shanks, explores the ever-recurring subject in his article “The Four-Room House: Ancient Israel’s Major Architectural Achievement” in the July/August 2017 issue of BAR. So what exactly is the issue? And what is this “four-room house” anyway? The name would imply that a four-room house is a house consisting of four rooms. In reality, the majority of houses under this rubric only had three rooms—but also five or more. “Four-room house” is more a technical, generic term. What is, on the other hand, 100 percent characteristic of four-room houses is the presence of long rooms and a transverse broad room in the back, all of which could be subdivided (by actual walls or columns). Importantly, early examples are much less orthodox in their layout than the later houses that follow the well-developed paradigm. It has been established that the four-room house is a typical feature of Iron Age Palestine. It has also been argued that the house type is typically Israelite, meaning that it appears as a characteristic feature of Israelite settlements. By extension, some would say, the four-room house signals the identity of the settlers of any given site as Israelite; in other words, the presence of the four-room house can be used to identify archaeological sites as occupied by a specific ethnic group—the Israelites. Most scholars no longer subscribe to this ethnic interpretation; instead, they try to explain the wide distribution of this specific house type by its functionality. Nevertheless, the four-room house as architectural form remains important for the study of Israelite ethnicity. Finally, what do we know about the origins of this house form? It seems that the process leading to the canonical form of the four-room house started as early as the late 13th century B.C.E. One of the two main theories links the origins to the tents of the pre-sedentary, nomadic (proto-)Israelites; the other theory considers the origins of this form in the Late Bronze Age architecture of the Canaanite lowlands (the Shephelah). We may never know for sure. Excavated from Stratum VII at Tel Batash, this large pillared building dates from the Late Bronze Age. Even though this is an isolated example, the 14th-century date and the location in the Shephelah may suggest that the four-room houses of Iron Age Israel had their antecedents in the preceding period, still before the Israelites reportedly come to Canaan. Photo: G. L. Kelm & A. Mazar, Timna (Winona Lake, 1995), p. 56. 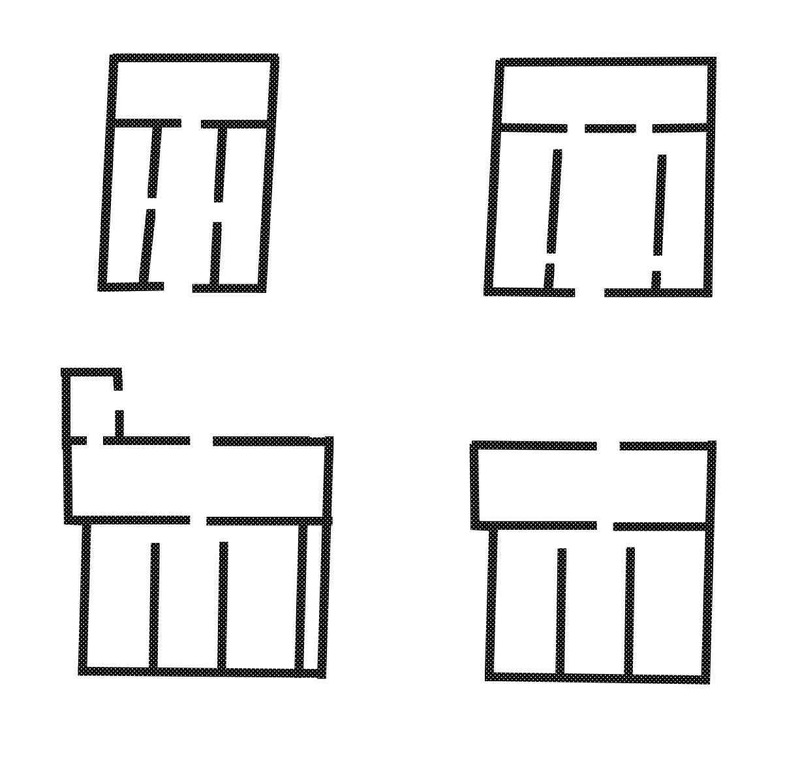 Looking at three early examples of possible four-room houses (from Egyptian Thebes, Canaanite Tel Batash and Tall al-‘Umayri in present-day Jordan), Hershel Shanks addresses specifically the issue of circular argumentation, which too often impairs any serious attempt to identify an Iron Age house as Israelite. “We see four-room houses at Israelite sites as a marker of Israelites, and then we use the appearance of a four-room house to identify an Israelite site. Which came first—the chicken or the egg?” wonders Shanks. BAS Library Members: Read the full article “The Four-Room House: Ancient Israel’s Major Architectural Achievement” by Hershel Shanks in the July/August 2017 issue of Biblical Archaeology Review. When I looked into this, it seemed apparent that the Israelite four room house was derived from the Hyksos four roomed chapel. See the image below. This similarity fits in very nicely with the assertion by Josephus Flavius that the Israelites and the Hyksos were the same people.